The soft, adorable Jellycat stuffed animals at Distinctive Decor are designed in England for children around the world. England's Jellycat stuffed animals are also a favorite of grownups who love to hug furry, squishy animals crafted of plush fabrics with exquisite detailing. Our Jellycat soft toy collection includes puppies, kittens, lambs, turtles and huggable elephants designed at Jellycat's London headquarters. 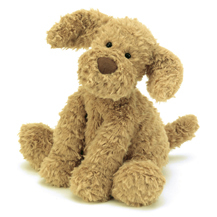 Our quirky critters include the company's beloved Fuddlewuddle puppy, along with Bashfuls and furry Chou Chous. Shop Jellycat's monkeys, tigers, bunnies, stuffed ladybugs and other luxury plush animals. Also shop our collection of Jellycat children's books, including board books for infants and toddlers. We have splendid gifts for children, including charming tea sets and affordable designer bibs. We have sweet baby blankets by Milkbarn, Little Giraffe and Darzzi. Shop our Noodle & Boo baby care collection. Our reusable coloring placemats by Modern Twist are favorites for rainy day weekends, travel and children's parties. Also browse our Growing Up Girls birthday girl figurine by Enesco.